While I was pregnant with Nathaniel, I put a lot of thought and energy into finding ways to make the most of the space in his small nursery. Thanks to our thoughtful and generous family and friends, before he was even born, Nathaniel had acquired lots of toys baby gear, as well as quite an extensive wardrobe. Now that he has arrived, it still seems as if his wardrobe and toy collection continue to grow and grow. Plus, I needed to find adequate storage for my stockpile of diaper and wipes. 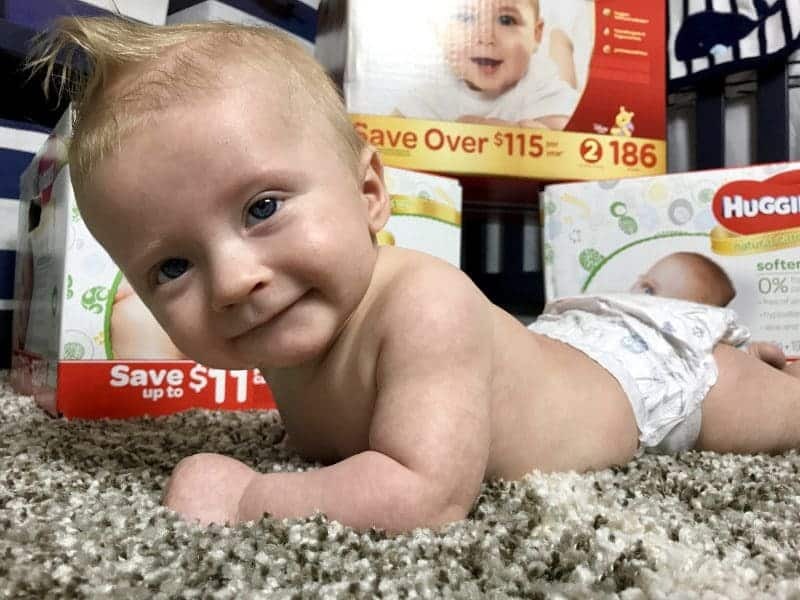 As a new mom I realized how quickly spending money on diapers and wipes adds up. That is why I stock up on Huggies® diapers and wipes when I find them at great prices. My little guy loves his Huggies! 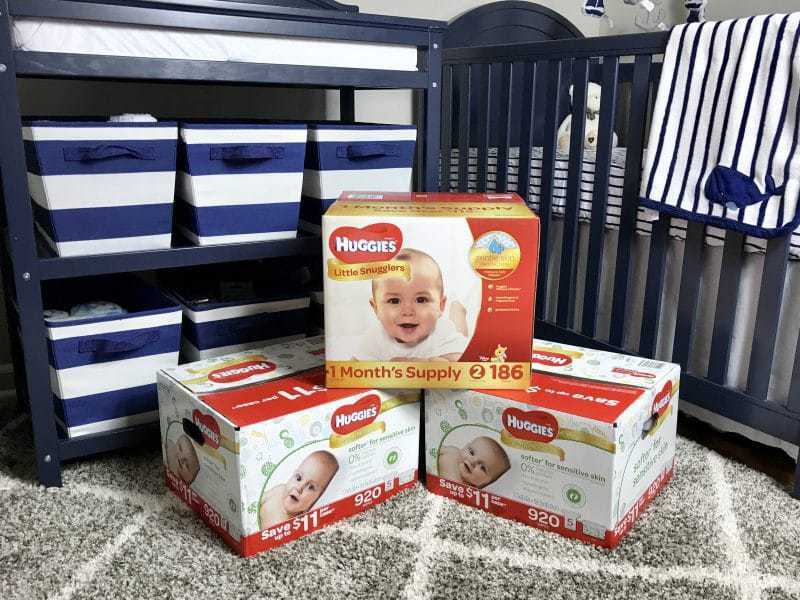 Just this past week I was able to snag 2 gigantic boxes of Huggies Natural Care Baby Wipes and 1 huge box of Huggies Little Snugglers Diapers from Sam's Club with unbelievable savings. Sam's Club is currently offering $45 in Instant Saving to new members who purchase 3 participating Huggies products. Simply join Sam's Club online here or sign up in store at your local club (if signing up at your local store be sure to print this offer out and bring it with you to the Membership Desk). I joined online and was able to get a $5 e-gift card too! Now that I am a Sam's Club member, I have found so many reasons to love this club. From Sam's Club's Scan and Go service to their subscription service, they make shopping with them easy and convenient. Not to mention the savings I get when buying in bulk! Then, buy any 3 participating Huggies products. $45 Instant Savings will be instantly loaded onto your new Sam’s Club Membership Card. Ok, now back to nursery storage and organization. Organization, and sneaking storage in every nook and cranny I can find, has allowed us to fit all baby's things in his small room neatly. So listen up mamas, because today I am going to share my best nursery and storage and organization tips with you! Designate one drawer for your little one's current size clothing, and another drawer for the next size up. Clothing more than one size up can be stored in additional drawers, if you have them available. If you are short on drawers, go ahead and place clothing that doesn't yet fit in storage bins in the closet or under the bed (more on that in a bit). For hanging clothing, use hanging dividers to separate different sizes of clothing. Sorting my little guy's clothing by size, and storing each size separately, has allowed me to easy phase out sizes as soon as he grows out of them, and move in the next size. This next one is seriously my favorite nursery storage and organization tip ever. 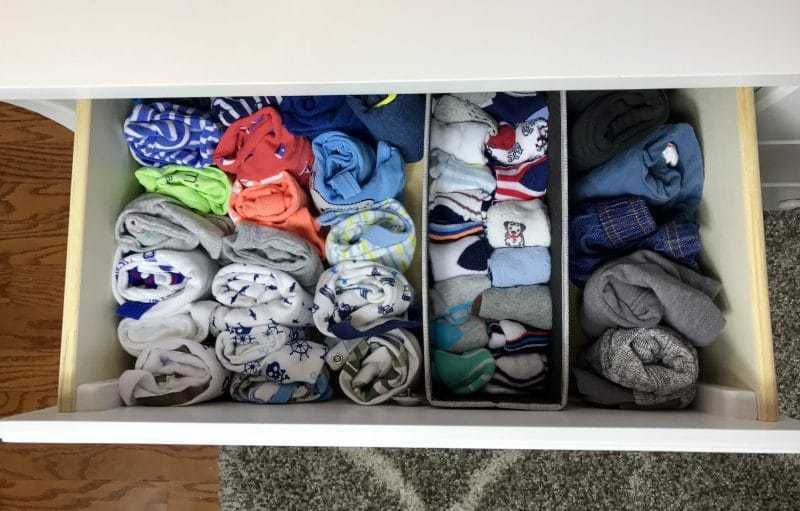 Fold / roll each piece of clothing so that it stands upright in the drawer, allowing you to open the drawer and see every piece of clothing without touching a thing. This makes it super easy to find what you are looking for, plus it looks very neat and organized. 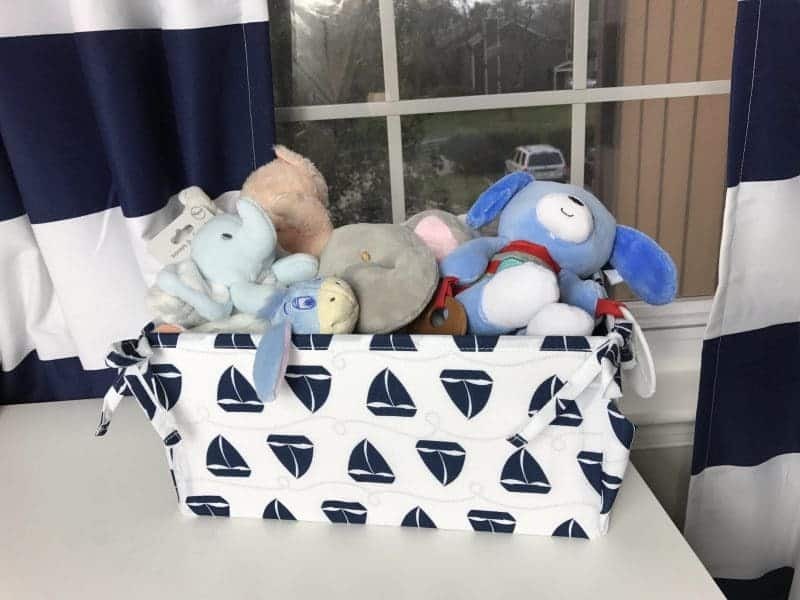 Use fabric bins or drawer organizers to separate items such as socks, hats, washcloths, etc… This keeps everything nicely organized and easy to find. I highly recommend a changing table with storage underneath. 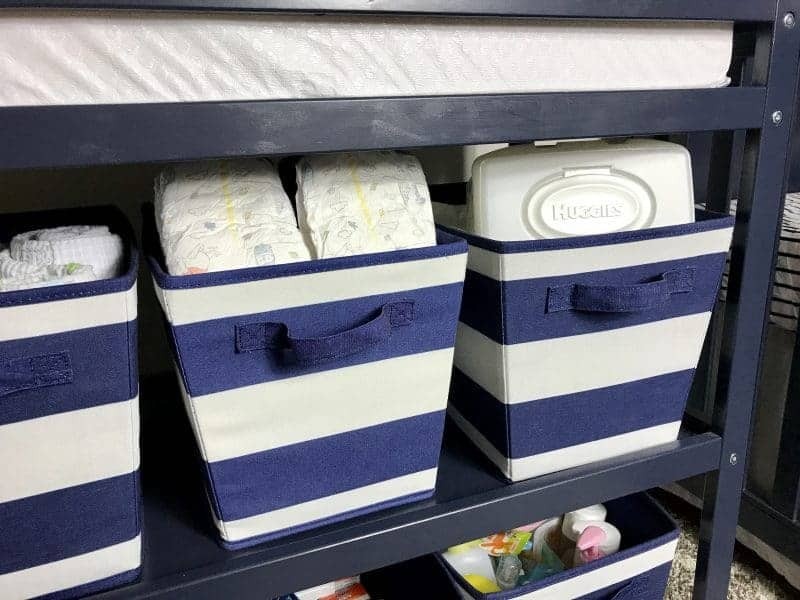 Cubbies or storage bins are a great place to store things like diapers, wipes, diaper cream, bath supplies, and swaddle blankets. The changing table we got for Nathaniel's room has 2 shelves, which we were able to fit 6 storage bins on. These bins have been great for storing my stockpile of Huggies diapers and wipes. This one is a life changer – there is a whole lot of storage real estate down under that crib. Need a place to store clothing that doesn't yet fit baby? Searching for a place for all that extra bedding? What about diapers? Invest in a plastic under bed bin or fabric storage container and pack it with whatever needs storage. 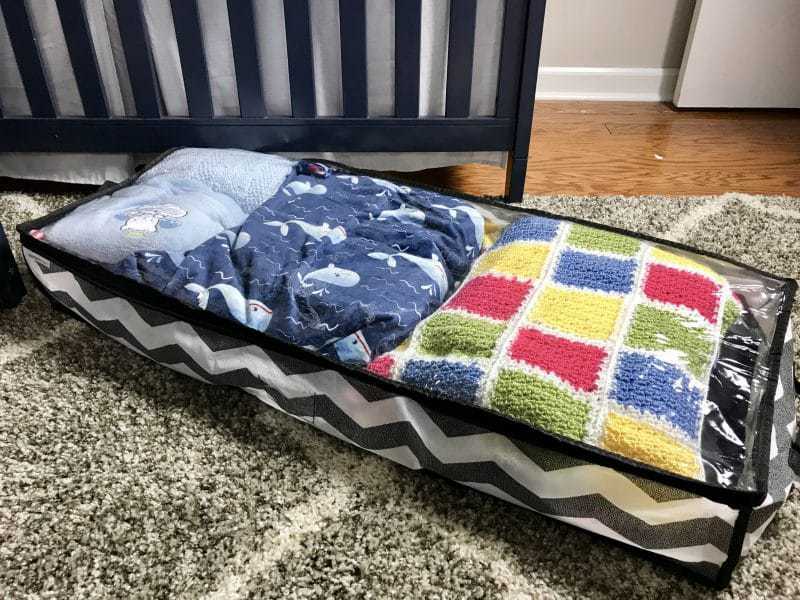 The fabric under the bed storage container I use is great because it is soft enough for me to shove under the crib without needing to lift it up. Plus, it fits basically all of Nathaniel's sheets, mattress covers, and blankets. A single bar across the top of the closet for hanging clothing works for you, but may not be best for baby. It doesn't make sense for your little one's closet to be set up the same as your closet. Baby's clothing is a fraction of the length of your clothing. Need a lot of space for hanging? Instead of a single bar clothing rod, make it a double bar closet and double the hanging space instantly. Or, if you need more shelf storage space, place shelving in the bottom half of the closet. 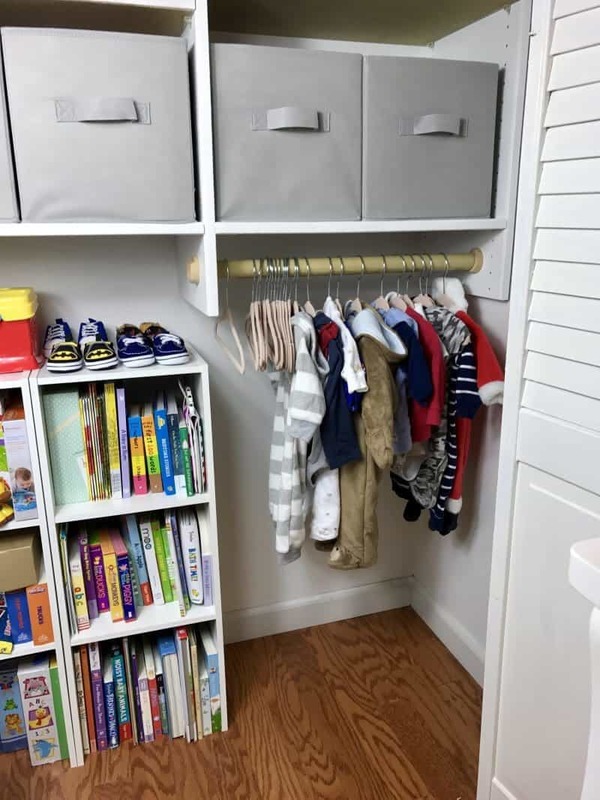 We have our nursery closet setup with adjustable shelving, which allows us to move around shelves and add or remove hanging clothing bars as needed. This one is fun! Instead of stacking a bunch of bibs on top of each other in a drawer or bin, hang those bibs up. Hanging bibs keeps them organized and makes it easy to find the one you are looking for quickly. Plus, they take up less precious drawer or shelf space this way. 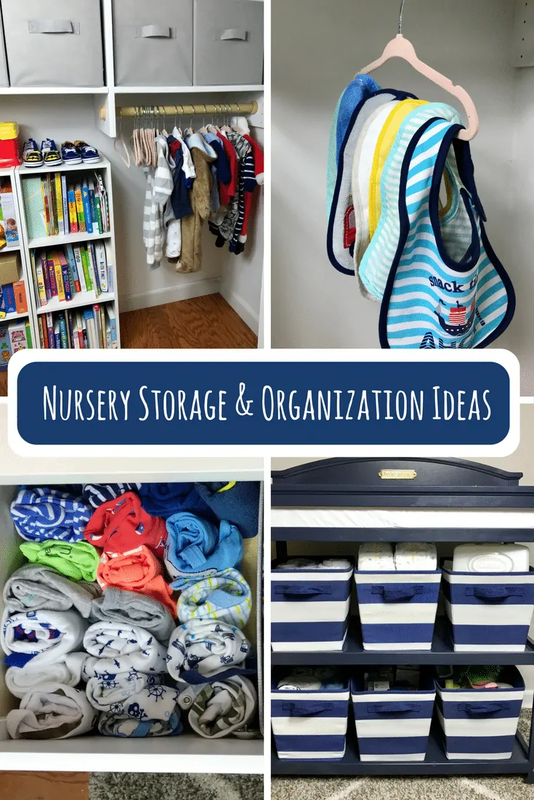 One last nursery storage and organization hack for you. Have a bunch of toys that you need a place for? Pop them in a large storage bin. Stuffed animals taking over the room? Stick 'em in a storage bin. Storage bins keep items corralled and organized, while also keeping them easy to access. What are your nursery storage and organization tips? 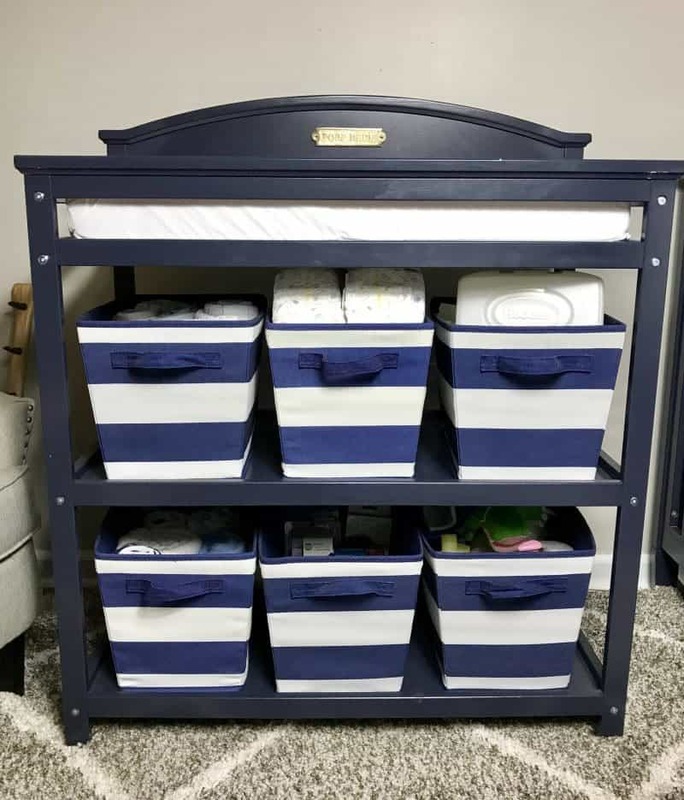 I hope that these nursery storage and organization help you maximize the space in your little one's nursery. If you have any great storage or organization tips please share them with us in the comments below! We would love to hear them. We are out of the diaper stage now but I am going to use your storage advice for our playroom and kids bedrooms. Goodness there is so much stuff!!! We loved Huggies when the kids were babies too. THey are a great diaper. Sounds like you’ve found some of the best places to buy Huggies. 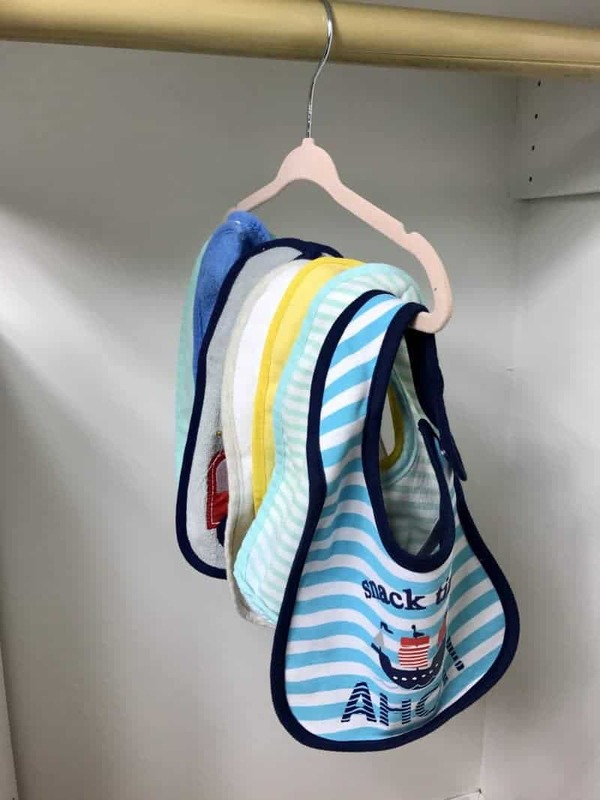 Hanging bibs on a hanger is a great idea! I agree that storage bins are handy for so many things, including kids’ toys and stuffed animals. And you’re so right… under the crib is a great storage place. I over looked it for years. Oh my word! Nathaniel is absolutely darling!!! These are such great suggestions! It’s amazing how quickly baby stuff can get out of control. Storage bins make such a huge difference! My twins are 11 now and we still use storage bins to keep the clutter somewhat under control! Nice share, good ways to keep organized.